Brunch fans (meaning everyone reading this) will have more options than usual this Sunday, when restaurants around town roll out special Easter versions of our favorite meal of the week; think fancy buffets, Easter-themed specials, springy cocktails, and restaurants that don’t even usually offer brunch getting in on the game. 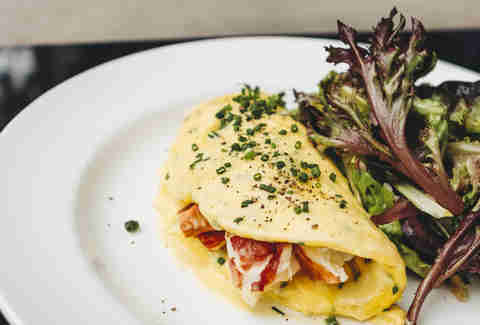 Whether you’re looking for champagne and caviar or bottomless Bloody Marys paired with pancakes, our Easter brunch guide has got you covered. Beware: The Easter Bunny is slated to show up at a few of the venues below, though we hear he doesn’t look as creepy as he used to (probably because of Instagram). Plan appropriately. The longstanding modern Asian staple (which completed a $10 million renovation last year) will open for brunch for the first time in honor of the holiday with a $55 prix fixe menu. 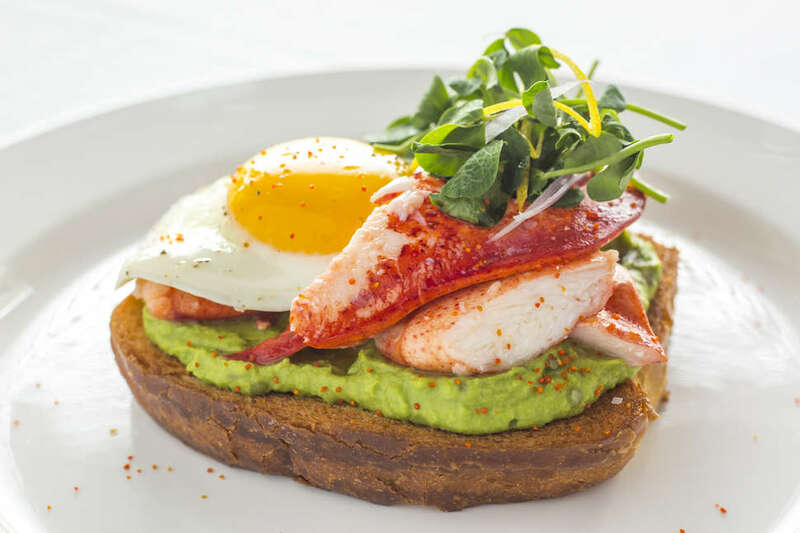 Expect seafood-focused fare including sunchoke eggs with Beluga caviar, a Dungeness crab omelet, and lobster bao Benedict. The deal also includes unlimited Easter Champagne cocktails; drink details are TBD, but it’s included, so you’ll be getting it. 12pm to 3pm. Reservations via the restaurant’s website. This Brentwood staple’s popular a la carte brunch menu will be replaced with one serious holiday buffet. The serious spread includes a raw bar, carving stations slicing up prime rib, leg of lamb, and roasted salmon as well as a bevy of breakfast-ier dishes (think French toast, chicken sausage, and chilaquiles), salads, fresh-baked pastries, and a dessert selection. Anything goes when it comes to LA’s food scene, and that includes Easter brunch at a sushi restaurant. The Pasadena outpost of this group of cool Cal-Asian eateries will be doing a special a la carte brunch with options ranging from yuzu avocado toast to and egg-topped to multiple versions of ramen. Wash it all down with a lychee sangria, peach Bellini, or fresh-pressed green juice depending on how productive you need to be later. Any kids in tow can stay busy with complimentary face painting, balloons, and candy bars, and let their poor parents eat in peace for once. 11:30am to 4pm. Reservations via the restaurant’s website. For an over-the-top Easter extravaganza, head over (ideally in some sort of fancy car) to this high-end Beverly Hills hotel, which will be setting up a lavish buffet with a serious raw bar of oysters, sushi, shrimp and snow crab; as well as a carving station with prime rib, spring lamb and Branzino. If you go before 3pm, you’ll get access to an omelet station and pancake/waffle spread before 3pm -- it's replaced by a pasta station after 3pm, so choose your preferred carbs and plan accordingly. The whole shebang goes for $132 for adults and $69 for kids. Easter egg hunts will place at 1pm and 3:30pm in the Beverly Canon Gardens for guests and diners. 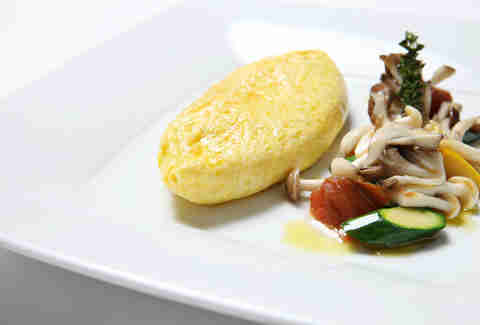 11am to 7pm Reservations via OpenTable. 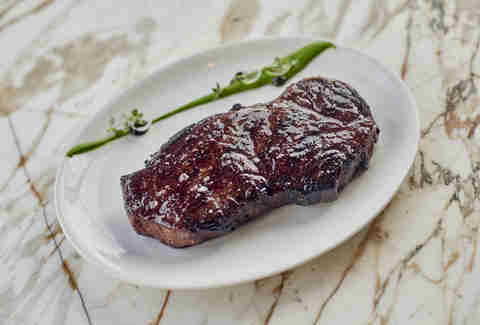 This modern steakhouse within the massive Americana at Brand will open its doors for a rare brunch on Easter, offering a $65 prix-fixe menu with a shakshuka-and-pork belly “bacon and eggs,” an Alaskan Crab Louie salad, and a filet mignon paired with a seven-minute egg plus desserts like ricotta donuts. A Bloody Mary cart will be making the rounds to create custom cocktails tableside. 11:30 am to 3pm. Reservations via OpenTable. 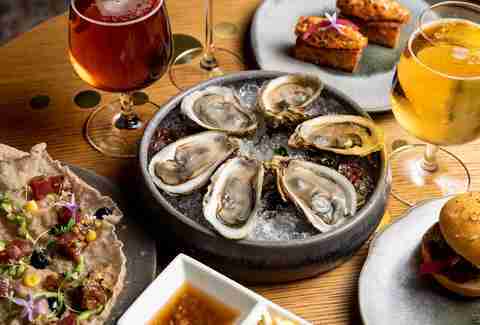 Seafood and steak are served with a side of swankiness at this modern American haunt. 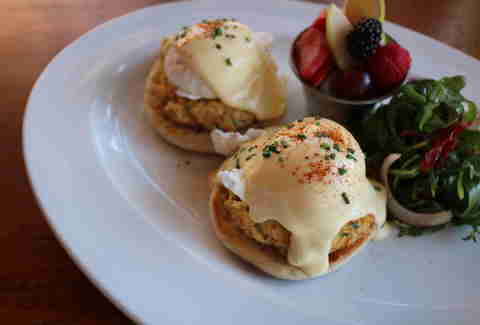 Its special Easter a la carte menu will include options like lobster and avocado toast, blackened salmon salad, and a short-rib-and-lobster benedict on a gouda potato cake. The Bloody Mary garnished with a jumbo shrimp seems tailor-made for your social feed. 11am to 3pm. Reservations via OpenTable. Get ready for a big old buffet and live music in the hotel’s pool-adjacent courtyard, with everything from a carving station to made-to-order omelets to entrees like braised short ribs, along with a dynamite dessert spread priced at $104 for adults and $52 for kids 12 and under (which includes tax, gratuity and a glass of bubbly for those of drinking age). The hotel will hold an Easter egg hunt at 1:30pm, and make the Easter Bunny available for photos beforehand. 12pm to 3pm. Buy tickets via EventBrite. The SLS will open its Garden Terrace with a retractable roof -- usually reserved for private events -- for the buffet brunch priced at $125 for adults and $45 for children. Expect some José Andrés signature dishes, including Valencia-style paella as well as made-to-order-omelets, pancakes, and waffles; a carving station, including roast leg of lamb; one impressive-sounding seafood spread of oysters, king crab, caviar, and smoked salmon from NYC’s, and desserts from the hotel’s fabled Patisserie. The adults can look forward to unlimited bubbles (for an extra $25) while kids will get a candy special delivery from the actual Easter bunny. 10am to 3pm. 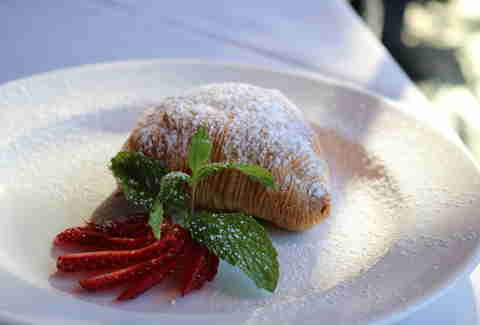 Reservations can be made by calling 310.246.2175. If your answer to "How many small plates can you eat in a single sitting?" is "How many you got? 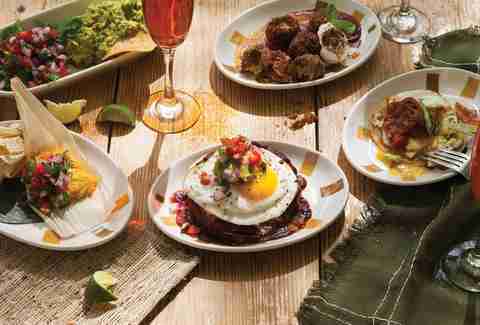 ", then Susan Feniger and Mary Sue Milliken’s festive Mexican-inspired DTLA eatery is the spot for you this Sunday. For 30 well-spent bucks you can get unlimited small plates, ranging from plantain empanadas to chicken tinga tamale to dulce de leche churro tots; amp it up with bottomless Mimosas, Micheladas, and Bloody Marys for another $20. 10am to 3pm. Reservations via OpenTable. If you’re looking to trade Peeps for pasta, this contemporary Italian eatery will roll out an Easter menu inspired by the Amalfi Coast, with offerings like a housemade orecchiette with lamb ragu; black truffle, asparagus, and sausage risotto; and wood oven-roasted veal chops. Look for with Mimosas, Bellinis, and special Easter cocktails as well. 11:30am to 2pm. Reservations via Resy. The onsite restaurant at the Westdrift hotel will is pulling out all the family-friendly stops to go with brunch this year, including face painting, a petting zoo, and an appearance by you know who. As for the brunch, it’s a buffet with takes on classics like a duck confit hash and sous vide eggs, a smoked salmon spread, and a paella station with seafood and veggie options. The $69 adult price includes bottomless Champagne (and the $30 kids’ price, of course, doesn’t). OK, so it’s not exactly a formal brunch, but if you’re heading to someone’s place for a holiday meal, nobody’s gonna kick you out for bringing donuts. 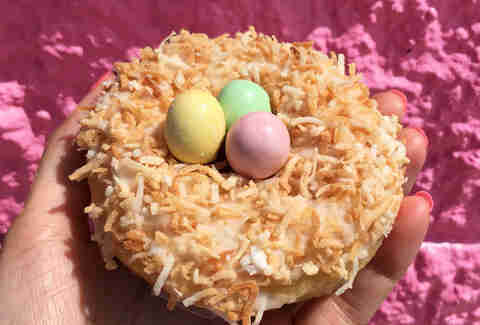 Actor Danny Trejo’s bright pink donut shop -- an offshoot of his chain of taquerias -- has already started selling its special holiday donuts for a $2.50 a pop, including the Chicki Linda, a yellow buttermilk-glazed chick-themed treat filled with horchata pastry cream; and the Sweet Eggscape, a shredded-coconut topped donut made to look like a nest with little malted eggs in the middle. Sold. Lizbeth Scordo is a food and lifestyle writer who just realized she stopped eating Peeps but isn’t sure when. Follow the rest of her discoveries on @modlizbeth and @lalizbeth.